It's time for the next installment of SRS and I am excited that JJ let me participate in this event. It's such a great way to learn of new food bloggers and network with them. Oh, it's also a great way to gather some new recipes from others and to get our blog seen more and share our recipes and crafts with others. Erika is a stay-at-home mom and lives with her family in Kansas. I had such a hard time picking a recipe of hers because she has so many good ones! I must have spent a few days looking over all the great pictures of her food creations, trying to figure out what I wanted to make. Her pictures are mouth-watering! 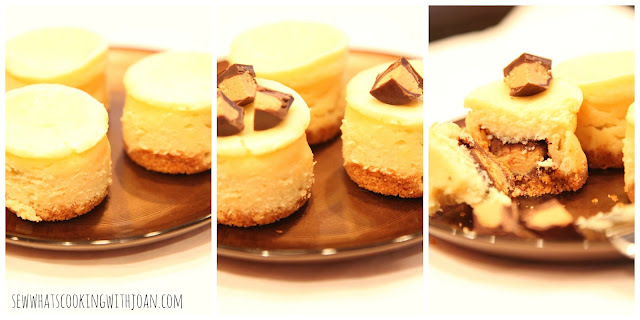 After many hours of deliberating, I decided to go with the Peanut Butter Cup Mini Cheesecakes. The reason being is because I just bought a mini cheesecake pan that I have been wanting to use but hadn't come across anything to use it for. 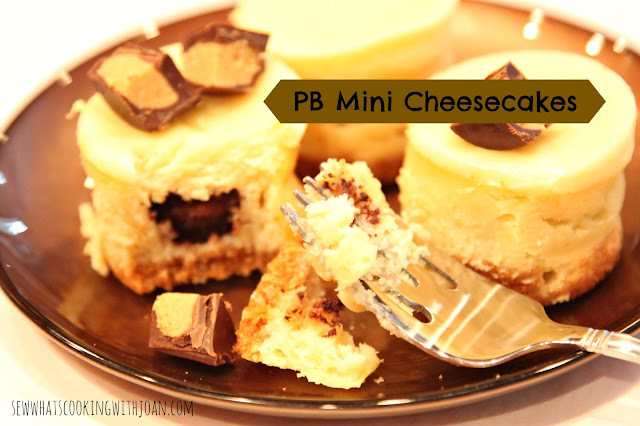 When I saw her posting for these little cheesecakes, a light bulb went off in my head and I was off! I had all the ingredients except for the mini peanut butter cups so I picked those up during an errand to Target. I decided to go with the dark chocolate mini cups as TT and I really enjoy dark over milk chocolate. 3. In a small bowl, combine graham cracker crumbs, sugar and melted butter until all the crumbs are moistened. 5. Beat cream cheese until soft and fluffy. 6. Add eggs one at a time, beating well between additions. 7. Use an ice cream scoop to spoon cream cheese mixture over crusts and peanut butter cups. 8. Bake until set, approximately 20 minutes. Cool completely in the fridge and enjoy! I can see that I would be making these again in the near furture. I'm thinking next time to use a chocolate crust...oh, yum! 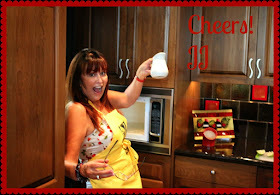 JJ and I are looking forward to next month's surprise recipe swap. If you would like to participate, click the link below to learn more about it. This is my kind of dessert. I love cheesecake and hiding something inside is a special treat. Thanks for your pumpkin bread which I made for the SRS. I love your blog and plan to return to make some other recipes, from here.